Video Cutter is an incredible software app that can help you edit your video files like a whiz. It is ideal for those who wish to have a tool that can help edit video files without going any hassle. Being a simple and efficient app, it makes the best video cutter that you can trust for all your needs. With the help of this tool you can extract the video clips from different types of videos. Why look any further? Our Video Cutter is an all in one solution that allows you to have great videos with ease. Our Video cutter app feature a simple interface. That is why you will be able to get started. It has some simple options and you can see it all on one window. So you can start making use of the software app without having to wait to learn any complex processes. The tool supports drag and drop feature as well which is great for users who are looking for simplicity. Besides, there is a preview pane that allows you to keep an eye on the whole process. You can also see the start and end point at the single window allowing you to select the videos likewise. That is not all, you can check the output folder as well. The video cutter allows you to preview and play the videos as you wish. Considering the whole process is very simple, our video Cutter makes a popular choice for all. You get the option to load the video clip and choose the start and end options. Since it supports a built-in video player, it requires you to input these values yourself. Do you have to edit MP4 or AVI video file? Video cutter app download at Media Freeware is the way to go! 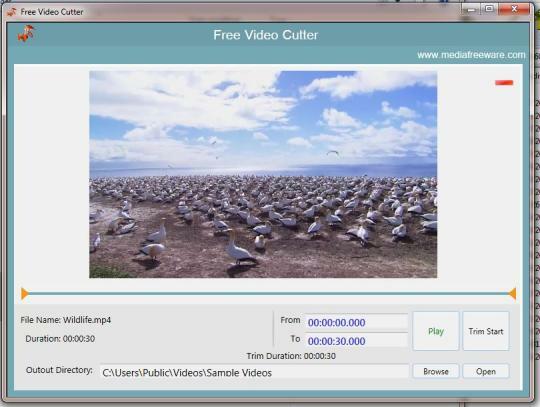 This free video cutter does a great job with most of the video formats. These include AVI, 3GP, WMV, MP4 and more. You can cut any video files in formats such as AVI, MPG, MP4 and FLV and save to your computer or laptop within no time. The software has the power to find the hardware configuration of your computer as well. It then picks the suitable option to cut the video, which is another plus of this video cutter. No matter what kind of video format you need to edit you can do it with the help of this smart Video Cutter. The perfect video cutter for all your needs! While our Video Cutter does not offer many options, it can be used to trim video files in an effective way. It is a simple and easy to use tool with no complexities. You may have to edit your professional video or wish to fine tune a personal memory. This tool is all you need to edit any video and make it perfect. So download this powerful video cutter and edit your video files now!